Betsy Dittmeyer, Stoneham’s new Chamber of Commerce secretary, was the kind of receptionist who would make Carol Beer look good. The Chamber was in dire need of a new rental, but Bob Kelly was throwing a wrench into the process. Tricia was anxious to make a bid on a private book collection, but with Angelica having to deal with Betsy, she was going to be late. “I don’t know how much longer I can tolerate this impossible situation.” The Cookery wasn’t exactly alive with the sound of music, but rather with Betsy’s incessant, annoying complaints. She didn’t like this, she didn’t like that, and she certainly didn’t like using a public restroom, but somehow managed to use one when the Cookery was full of customers. Tricia and Ange were finally getting ready to head out the door when there were loud, crashing noises coming from inside the building. Betsy was nowhere to be found, but when they did find her it wouldn’t be a pretty sight. If there were any silicone spatulas in the Cookery, they might have come in handy when they found her. Betsy was underneath a pile of Ange’s vintage cookbooks squashed flatter than a pancake. Maybe a crêpe. Tricia, the “village jinx,” would undoubtedly get a visit from Chief Grant Baker ... again. There were some very unusual things about this little accident and they spelled m-u-r-d-e-r.
Money talks, but Betsy was dead. Betsy, the napkin pilferer, was a simple receptionist, but it turned out she was a pretty wealthy one. Tricia’s ex, Christopher Benson, was Betsy’s financial advisor and maybe, just maybe she could drag a secret or two from him. Frannie Armstrong, whose big mouth was practically certified, might be good for a clue or ten or twenty. Betsy’s sister Joelle had strangely been thrown out of the will and was lurking around. There were plenty of secrets and lies in Stoneham and Tricia was shocked to find out a family secret of her own. Just who had more skeletons in their closets? Was it Betsy Dittmeyer or Ms. Tricia Miles? 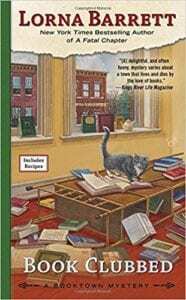 I’ve always loved the Booktown Mysteries, but this one has got to be one of my favorites. Perhaps it was a matter of simply saving the best for last. This book had some real surprises in between the pages, many I was totally unprepared for. There are some little bundles of joy waiting for everyone, but Tricia’s secrets (and the ultimate ending of the book) had that wow factor that made the book. About a third of the way through the book dirt on everyone was oozing out of the pages. Book Clubbed was a fast read, an entertaining cozy I’ll remember for a long time. Quill says: This is a fast-paced mystery with dirt oozing from the pages ... Barrett definitely save the best Booktown Mystery for last!